While liberals on social media and the mainstream media are distracted by, and literally having a meltdown over President Trump's decision to publicly acknowledge Jerusalem as Israel's capital, and that plans are being made to finally move the U.S. embassy to Jerusalem, both actions aligning with the "Jerusalem Embassy Act of 1995," during Clinton's presidency, something big is happening in Washington DC. As anyone not living under a rock are aware of, President Trump likes to tweet, usually causing the media to cry out in outrage and dedicate a whole news cycle to his social media statements, but this morning instead of weighing in on a variety of topics and offering his colorful opinions, at 10:00 am ET, he tweeted one statement, in caps, "MAKE AMERICAN GREAT AGAIN." While that was Trump's campaign war cry and we have seen him and his son Don Jr. often tweet opinions using the #MAGA hashtag, this limited tweet, without an opinion on any actual news item along with the statement is notable for a variety of reasons. First it came out right after a short Fox 5 local report about unusual activity occurring in Washington DC and Prince William County, Virginia, which includes multiple federal agencies, included but not limited to The Bureau of Alcohol, Tobacco, Firearms and Explosives and the Federal Bureau of Investigation, along with local law enforcement agencies, with what is described as a "police presence" in VA. According to the report "exact locations of activity have not been released nor have the nature of the operations." Via other sources we know that this activity is court authorized, and that the VA police presence is believed to be gang-related, which makes sense since Fairfax County, which neighbors Prince William, has been reported to hold 1,400 MS-13 members, according to the Daily Caller. Another report, published just a minute before the President's MAGA tweet, details comments Circa's Sara Carter made about a huge shakeup that is coming as she reveals that out of the 27 active and open investigations being conducted by the DOJ into leaks of classified information to the press for "political motive," some of them are directly related to the FBI, and she has learned that members of the FBI have had to take lie-detector tests. As we have noted on a number of occasions, President Trump quite often gives clues, hints at what is coming, sometimes months in advance and sometimes days, and on December 3rd, as Stefan Stanford reported, the President specifically highlighted that "After years of Comey, with the phony and dishonest Clinton investigation (and more) running the FBI, its reputation is in Tatters - worst in History! But fear not, we will bring it back to greatness." Following that on the same day, Trump said "Report: ANTI-TRUMP FBI AGENT LED CLINTON EMAIL PROBE" Now it all starts to make sense!" His reference was to Peter Strzok, an FBI agent that Robert Mueller has demoted after discovering his anti-Trump texts to his mistress, then Mueller refused to come clean with Congress about the reason for his transfer off the Mueller team. Since that bombshell dropped, much more information has been discovered not only about his bias against the President, but that he played key roles in several major controversial scandals and investigations, such as the Hillary Clinton email server investigation, as well as being behind the key change in wording by former FBI director James Comey, calling Clinton's actions "extremely careless," instead of the original wording of "grossly negligent" which could have caused Clinton to suffer legal ramifications under federal law. Strzok may have also used the Kremlin sourced "dossier" in order to obtain FISA warrants to tap into Trump campaign members communications, and Strokz was behind the whole Russia collusion investigation from the beginning. 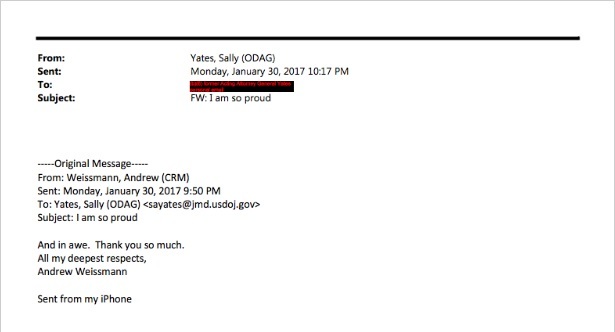 To top it all off, new reports show that Strzok was not the only high ranking member of Mueller's team who is virulently anti-Trump, as Judicial Watch has obtained emails from Andrew Weissmann, Mueller's deputy, indicating his praise for former acting AG Sally Yates for refusing to defend President Trump's travel ban in court, a decision she was immediately terminated for, and since then the Supreme Court has allowed it in full, where Weissmann told her via email "I am so proud. And in awe. Thank you so much. All my deepest respects, Andrew Weissmann." In order to see exactly how corrupt Mueller, Strzok, Weissmann and the entire special counsel team is, Sean Hannity has done an outstanding job detailing it by investigating the investigators, using a chart format to show the connections.... in his must-watch opening statement from December 5, 2017. Following his opening statement, both Sara Carter, and Tom Fitton from Judicial Watch, who uncovered the latest emails between Weissmann and Yates, join Hannity to weigh in on what is coming. The corruption and rot goes so deep and is so blatant that even the Wall Street Journal Editorial Board is addrressing "Mueller's Credibility Problem," accusing him of "stonewalling Congress and protecting the FBI," which he was the former Director of. Sidney Powell, former federal prosecutor in three districts under nine U.S. attorneys from both political parties, then in private practice now for more than 20 years, as well as being a past president of the Bar Association of the 5th Federal Circuit and of the American Academy of Appellate Lawyers, writes a scathing article over at The Daily Caller, shredding Mueller and his "hit squad," as she concludes with "Mueller’s hit squad epitomizes the swamp that President Trump was elected to drain. Its charges are irreparably tainted by its members’ biases, corrupted evidence, and intolerable conflicts of interest. Congress cannot legitimately continue to waste taxpayer dollars to fund this effort." Throughout the campaign season we saw the then-candidate Trump, as well as when he was the official GOP nominee during the general election, consistently send the MSM and liberals off to chase their tails in outrage, while he went about his business of knocking 16 GOP primary candidates out of the race, then going on to win the general election, and as he has shown throughout this first year of his presidency, he continues to do the same thing, and they continue to fall for it. The pressure on Mueller himself to step down is just beginning, and as more dirt on him and his team continues to be revealed, the decision may soon be taken out of his hands.